I couldn’t begin my journey without starting with the person cited to be the first person to write a computer program; especially as today marks the 197th anniversary of her birth. This being Ada Lovelace (1815 – 1852) of course, an English mathematician. During her childhood, Ada was very ill but despite several disabling illnesses she continued her education, focussing on maths and science, for which she was privately schooled. Her gift for mathematics really began to emerge when she was seventeen and her passion dominated much of her adult life. Between 1842 and 1843 Ada translated an article written by an Italian mathematician called Luigi Menabrea which was about Charles Babbage’s early design for a mechanical computer called the Analytical Engine. When Ada translated the notes she supplemented these with a set of her own notes. 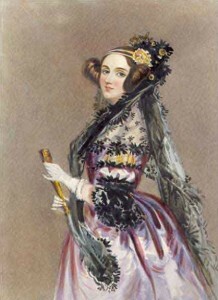 Within her notes she described an algorithm for the analytical engine to compute “Bernoulli numbers” (a sequence of numbers that are important in number theory and analysis) and this is considered to be the first algorithm ever specifically tailored for implementation on a computer. This is the reason Ada is often recognised as the first computer programmer. Unfortunately she was never able to see her algorithm in action as the first general-purpose computers were not built until nearly 100 years after her death.